Caribbean tourism development is a rewarding undertaking that requires dedication, cooperation, and a significant amount of human talent in order to facilitate sustainable livelihoods for our people. Here are some of the key persons and organisations that contribute to the enhancement of the regional economic driver that is Caribbean Tourism. 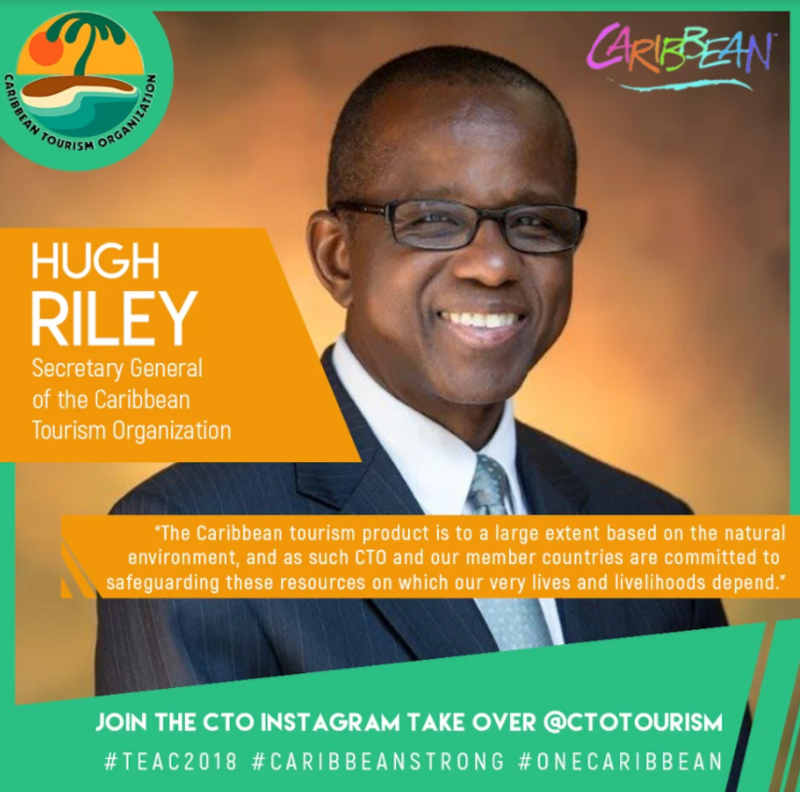 His overall responsibility is to deliver the CTO’s mission as the Caribbean’s tourism development agency, providing specialized services and technical support to twenty-four governments and a variety of private sector members. Services include research and statistics including information technology, advocacy, marketing and public relations, human resource development, and sustainable tourism development. 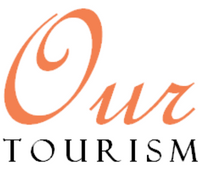 His Total Visitor Satisfaction concept has been described as a singularly competitive tool for the tourism industry. A former BBC-trained broadcaster, he was educated at the City University of New York and Thomas Edison State College of New Jersey where he earned a bachelor’s degree in communications, and at the University of Surrey in the UK. He is a member of the Destination Council of the United Nations World Tourism Organization and a member of the Board of Directors of various tourism marketing and academic bodies, regionally and internationally. 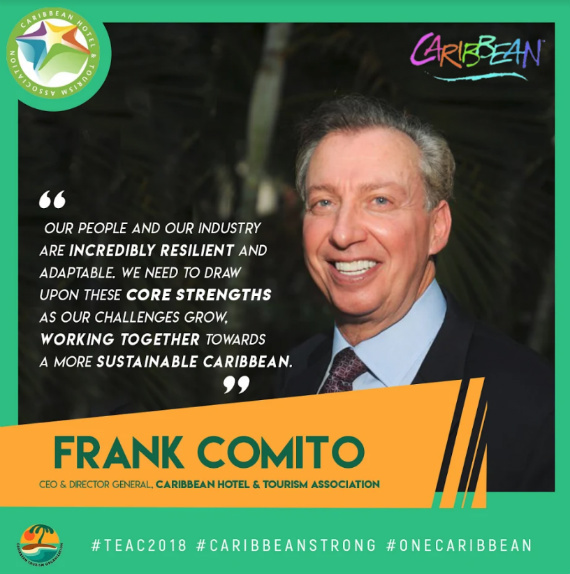 Meet industry titan Frank Comito, the CEO and Director General for the Caribbean Hotel & Tourism Association, one of the CTO’s key partners. He has held executive positions with the Nassau Tourism & Development Board, the National Alliance of Business in Washington DC., and earlier with the St. Croix Chamber of Commerce. Regionally, he was President of the Caribbean Society of Hotel Association Executives a long-serving member of the Board of Directors for CHTA. Frank was Deputy Chairman of the Nassau Airport Development Company where he helped to guide a $410 million investment in upgrading the airport. He served on the Board for the International Downtown Association and is a Lifetime Director for the Downtown Nassau Partnership. 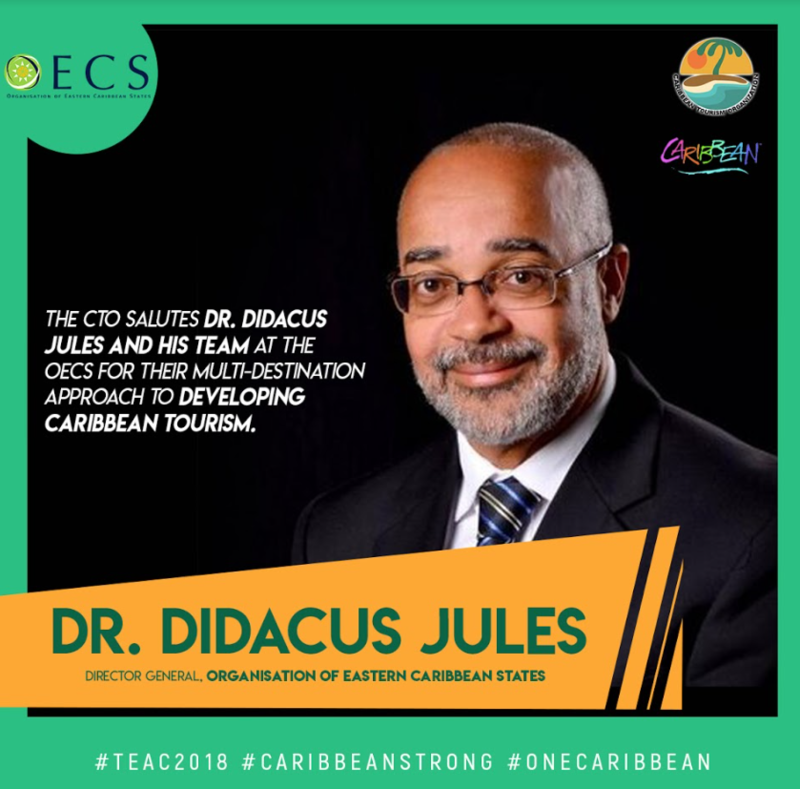 Dr. Didacus Jules is the Director General, of the Organisation of Eastern Caribbean States,. In this capacity he is responsible for driving the regional integration thrust towards a single economic and social space involving ten Eastern Caribbean States. Dr. Jules had had extensive regional and international experience, most of it focused on education, social policy and organisational transformation. He served as Registrar and Chief Executive Officer of the Caribbean Examinations Council (2008-2014) leading a thorough modernization of the Council. He has also served as Vice President Human Resources Cable and Wireless St, Lucia (2005-2008); Permanent Secretary for Education & Human Resource Development St. Lucia (1997-2008) as well as Permanent Secretary for Education and Chief Education Officer in revolutionary Grenada from 1981-1983. He has provided consultancy services to national governments, regional and international organisations in the Caribbean, Africa, Europe and North America. 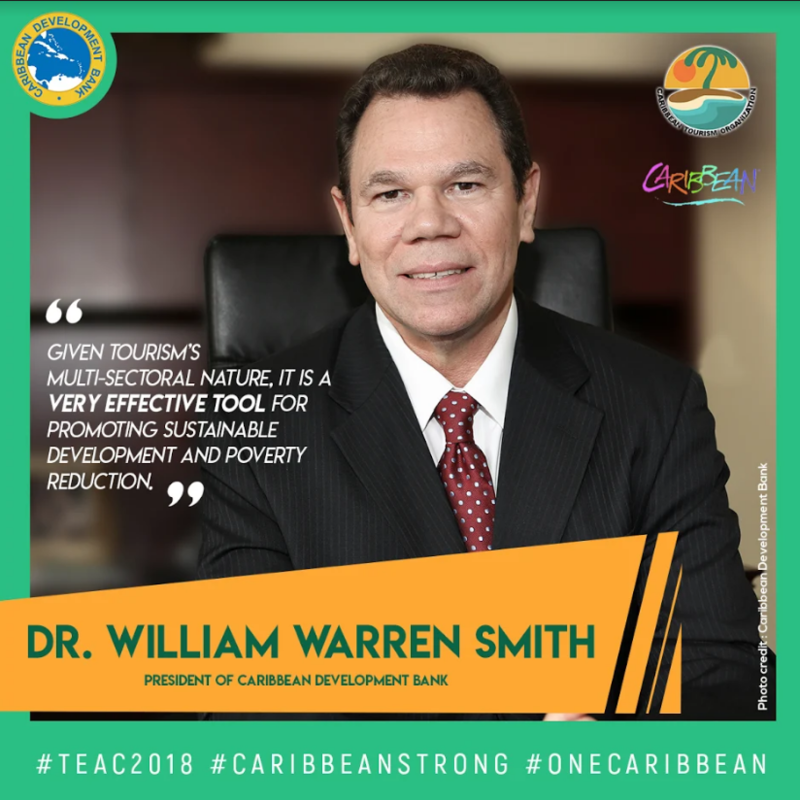 He chaired the World Bank’s Vision 2020 Committee on Education in the Caribbean and has served on many private sectors, educational, and philanthropic boards. He holds a BA (Hons) from the University of the West Indies Cave Hill, an MSc in Curriculum & Instruction and a PhD in Educational Policy and Curriculum & Instruction from the University of Wisconsin-Madison as well as a MBA from the University of the West Indies Cave Hill. Dr. Jules has authored numerous articles on educational policy, educational reform and adult education in the Caribbean and in small island states as well as other publications on public sector reform, organisational transformation and cultural studies. His work includes chapters in several books published by Routledge (1991, 1994, 2010), SUNY Press (1993), Nova Publications (2006). His career has been characterised by visionary transformational initiatives aimed at making Caribbean institutions more responsive to the needs of people, more competitive in the global arena and more efficient and sustainable. Dr. William Warren Smith was first elected at a special meeting of the CDB Board of Governors held on October 29, 2010, and assumed office on May 1, 2011. On November 6, 2015, Dr. Smith was re-elected to serve a second five-year term as president, beginning on May 1, 2016. Earlston McPhee joined The Bahamas Ministry of Tourism in 1985, tasked to develop the Tourism Master Plan for The Bahamas. In 1994, he initiated the development of The Bahamas Sustainable Tourism Development Policy Guidelines in collaboration with the Organization of American States, making the Bahamas the first nation to develop Sustainable Tourism guidelines. This project saw the establishment of the Sustainable Tourism Unit within the Ministry of Tourism in 1997, and was instrumental in the government being awarded the World Travel and Tourism Council’s Green Globe Environmental Achievement Award in 1996 and 1998. Earlston is currently responsible for sustainable tourism development and related projects in the office of the Minister. Throughout his career which spans over three decades, he has served in various position within The Bahamas Ministry of Tourism with responsibilities ranging from formulating planning frameworks for the development of the tourism sector to developing econometric models to forecast tourism activity and its impact on the Bahamian economy. He is actively involved in both leading and supporting the development of a strategic approach for The Bahamas Sustainable Tourism Development initiatives. Mr. Mcphee is the current Chairman of the Bahamas National Coastal Awareness Committee, and also serves as a Government appointed member of The Bahamas National Trust. A speaker and presenter at numerous national, regional and international events, Earlston uses these platforms to reiterate the importance of sustainability in tourism development, also highlighting the unique challenges and vulnerabilities of small island developing states and in particular, the Caribbean Region. 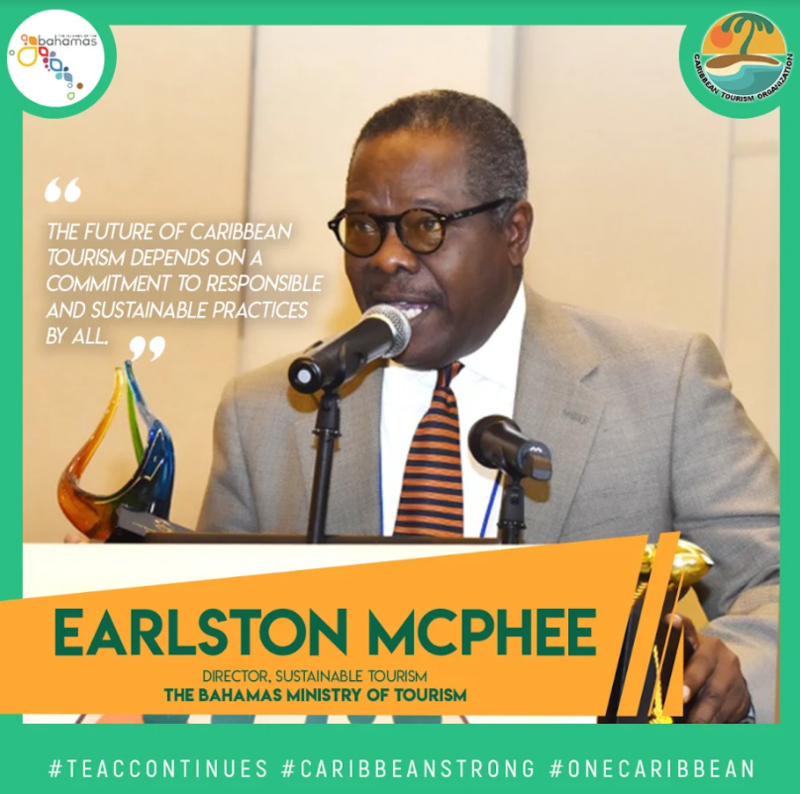 Earlston is well regarded as a sustainable tourism champion, and is the recipient of the Bahamas Hotel Association most prestigious Annual Sustainable Tourism Award, 2005 and the Caribbean Media Exchange “Caribbean Leadership in Tourism Award”, 2013; and the Caribbean Tourism Organization’s Regional Sustainable Tourism Champion Award in 2018. Adrian Trotman is the Chief of Applied Meteorology and Climatology (AM&C) at the Caribbean Institute for Meteorology and Hydrology (CIMH) – the training, research and development, and data archiving arm of the Caribbean Meteorological Organization (comprising the National Meteorological Services of sixteen Caribbean Member States). The AM&C group forms the core of the Regional Climate Centre for the Caribbean as designated by the World Meteorological Organization (WMO) in May 2017, which he also leads. Mr. Trotman has responsibility for Climate related issues including climate data management and dissemination, and the provision of weather and climate information and services to multiple socio-economic sectors. In his technical capacity, he focusses most on the Agriculture and Food Sector, with his specialised training and many years of experience in Agrometeorology in the Caribbean. 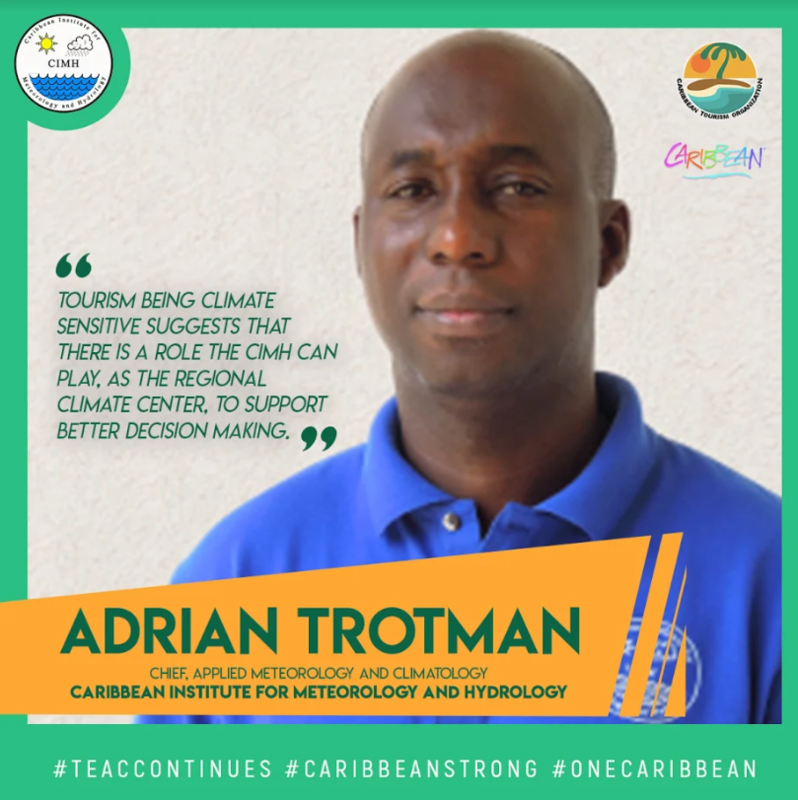 Driven by his interest in agricultural drought and its impacts, Mr. Trotman established the Caribbean Drought and Precipitation Monitoring Network in 2009 which was quickly brought into action during the severe 2009-2010 Caribbean drought. He has and continues to manage other regional projects and programmes related to weather and climate application and services across the Caribbean. Mr. Trotman also collaborates with WMO through its Commissions for Agricultural Meteorology (CAgM) and Climatology (CCL), being on several of its Expert Teams. He has also led and co-authored several scientific articles. 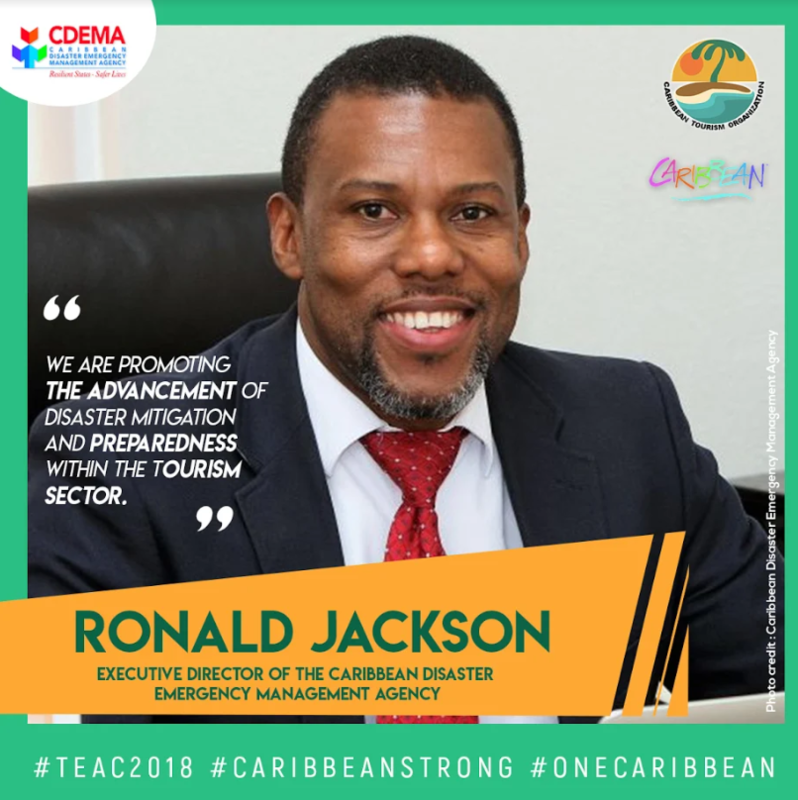 Mr Ronald Hugh Jackson was appointed as Executive Director of the Caribbean Disaster Emergency Management Agency (CDEMA) with effect from April 3, 2013, a position he holds until this day. Mr Jackson was the Director General of the Office of Disaster Preparedness and Emergency Management (ODPEM) in Jamaica, a position he held since August 2006 until March 2013. He previously served ODPEM as Deputy Director General, Senior Director of the Preparedness and Operations Division and as Regional Coordinator for the Southern parishes. Mr. Jackson holds a Master of Science Degree (M.Sc.) in Natural Resource Management and Environmental Resource Management from the University of the West Indies and a Bachelor of Science Degree (B.Sc.) in Physical Planning and Environmental Resource Development from the University of Technology.